One digital revenue source that many newspapers have become involved with during the past year is the daily coupon offering, whether it is Groupon or a homegrown version of it. The data reveal that on average, it is still a small part of the overall digital revenue, at 5%. But that is up from 1% a year earlier. The program is indeed popular. In all, 30 papers that provided detailed proprietary data reported that they are currently offering a daily deal program. In a few cases, the results were startling. One paper, with a circulation under 15,000, reported that in the third quarter of 2011 revenue from daily coupon deals, which didn’t exist one year earlier, accounted for 55% of its digital revenue. This is a paper where classified accounted for only 1% of the overall digital ad revenue. The success of the daily deal was not an accident. The paper had placed a major emphasis on selling daily deals. That was not generally the case. Of the 38 papers in the sample, only about one-third reported that the coupon programs were a major part of their sales efforts. There were other papers where daily deal coupons had made a major impact, again many of them very small papers. 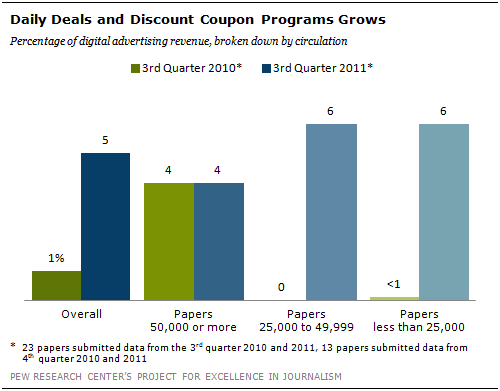 While the largest was 55%, another reported 27% of its digital ad revenue from the deals in the third quarter of 2011. And that too had grown from zero dollars a year earlier. In addition to identifying the daily deal program a major part of their sales efforts, the two papers had something else in common. They both derived a very small portion of their digital revenue, less than 5%, from classified advertising. About two-thirds of the papers that are offering a daily deal said they expected daily deals to generate an increasing share of digital revenue in the next year. But among the larger papers in our sample (circulation 50,000 and over) there was considerably less expectation that coupon deals would continue to be an increasing share of revenue. The interviews with newspaper executives reveal some significant differences of opinion about the future viability of the daily deal. An executive at a newspaper company where he says the daily deal is a significant component of their business expressed confidence that it would continue to grow at a healthy pace. Another indicated that his company had enjoyed an initial surge in revenue, but then experienced a quick leveling off, describing the daily deal as a "solid, but not hypergrowth business." Yet another-at a company generating less than the average 5% of digital ad revenue from the daily deal-largely dismissed it as a "fad." This company executive suggested that advertisers were growing dissatisfied with a kind of offer that was bringing in one-time customers looking for a deal rather than loyal repeat customers. "The Daily Deal is a kind of bubble," said another voicing the same sentiment. "I don’t think it’s a sustainable venture." Another executive said his company had tried Groupon for a year, but found that there were a number of other sales priorities that were more important. He described the daily deal market as "way oversaturated, a pile on," while acknowledging that perhaps the industry would find a better way to execute the program in the future.